Youtube video monetization criteria updated, the latest update will seriously affect small channels with lesser subscribers and small video lengths. As you already know, YouTube is a powerful platform to watch, share and enjoy videos. YouTube started monetizing videos from August 2006 and they started their YouTube Partnership Program (YPP) which allows vloggers to make money from the videos they upload. Youtube video monetization criteria created for enabling ads through YPP was to reach a total of 10,000 views. That means a YouTube video channel with 10,000 total views could show ads in their videos and start earning. On 16th January 2017, YouTube has officially announced on their YouTube Creators Blog that they are raising their monetization requirements. According to YouTube, they are doing this to protect original creators from bad players. The latest requirement is now 4,000 hours per year and a minimum of 1,000 channel subscribers. That means making money out of YouTube is no longer everyone’s cup of tea. Nobody likes ads, expecially when you want to watch a 5 minute song in YouTube but you have to watch through an entire two minute advertisement. But that’s an income source for thousands of YouTubers and Vloggers who make a living out of creating YouTube videos and maintaining channels. YouTube vlogging is now a billion dollar industry and the latest trend is now bringing thousands more to this industry because of the ongoing hike in smart phone users and internet population. You can easily understand the future scope of this industry if you already know that more than 50% of Indians are still out of internet. There are more than a million YouTubers who make money out of creating YouTube videos. But this new update is asking for more than what small channels can acheive without any professional crew or equipments and only popular channels can monetize their channel succesfully from now on. Because of these major changes in the YouTube Monetization Policy a lot of small channels will be affected badly because they will not able to show ads in their videos. Even though the small actors in the industry is will go in loss, there is a 40% rise in people who make more than a million out of YouTube channels. According to YouTube, their new year resolution is to focus on revenue stability and protecting original content. 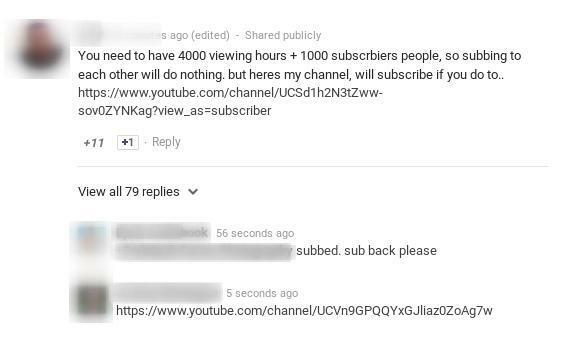 Funny thing is that some channels started commenting below the youtube blog post saying to like and subscribe their channels! What about those who already started monetizing but don’t fit the new criteria? Well, from 20th February 2018 onwards, they are going to apply these criteria to the existing channels on YouTube, giving a 30-days grace-period. After that, even if you had monetized before, you won’t be able to continue to show ads in your videos anymore. Many enthusiasts trying to make online videos are going to get stranded due to this latest policy change. If you have a channel and it doesn’t fit the new YouTube video monetization criteria, go and make the run for it, share them widely, you have just one month left!